Bushiroad is launching its "2019 Season" for the Cardfight!! 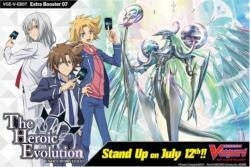 Vanguard trading card game with the release of The Heroic Evolution Extra Booster 07 expansion set on July 12. The Heroic Evolution will feature cards for the Link Joker, Kagero, and Nova Grappler clans, along with new trump cards for Kouji Ibuki’s and Kai Toshiki’s units, as depicted in the Cardfight!! Vanguard animated series. The expansion will be sold in 7-card booster packs, with each pack containing 2 cards of R or higher rarity. The complete set will include 66 cards, with 8 reissues, in the following rarities: 3 VR, 6 RRR, 9 RR, 15 R, and 33 C. 3 parallel XVR, or "Cross Vanguard Rare," cards featuring hot stamps and 3 parallel SCR cards will be randomly inserted in some packs. The packs will be available in 12-pack display boxes, and each box will include one VR or SVR card and one of three possible Gift Markers. As a bonus for those who pre-order, each carton pre-ordered will also include 2 bonus playmats. The launch of The Heroic Evolution will be supported with The Heroic Evolution Sneak Preview Kit, available to stores that want to host a pre-release event during the weekend of July 5-7. Each kit includes 39 booster packs, 9 promo cards, and 2 rubber playmats, enough to support up to eight players. Bushiroad is now organizing Cardfight!! Vanguard releases into "seasons." Each of the game’s 24 different clans will be featured in at least one release during each season. The 2019 Season will begin with The Heroic Evolution, and is scheduled to continue through the end of May, 2020.